IT HURTS Book 6 + Complete Series Bundle OUT NOW!! IT HURTS BOOK 6 (and books 1-5) AVAILABLE DIGITALLY FOR $6.99 EACH! BUY IT HURTS BOOKS DIGITALLY!! 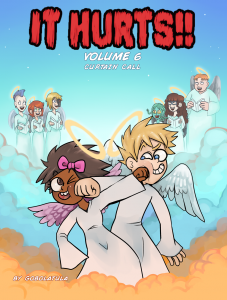 The print version of book 6 will be out in hopefully a couple weeks. But for now you can get it digitally! Update Schedule Changed to Mondays & Fridays! For the time being, I’m going to change the update schedule to Mondays and Fridays. The reason is that the updates have been longer than usual as of late. Back when I was doing IT HURTS, I was able to keep the M/W/F schedule mainly because the updates were mostly 6 panels long. These days the PLEASE FORGIVE ME comics are at least 2 pages with at least 6 panels+ each. So for now I’m going to aim for 2 comics a week and if I’m able to rebuild a decent buffer I’ll change back to 3/week as soon as I feel it’s right. Thank you for understanding! I made a change to comic 16 making it so you couldn’t see the date on Dad’s computer. My mistake! The date on his compy was something like March and right now it’s fall in the comic.